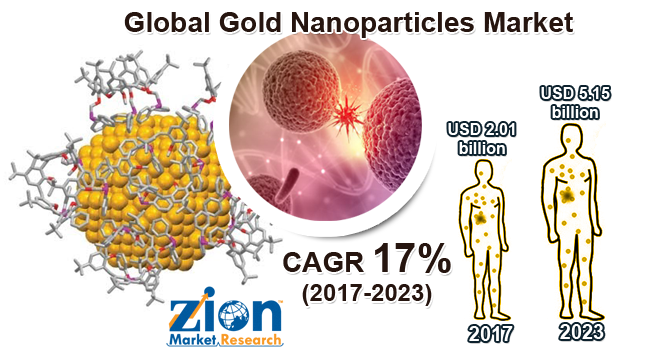 Zion Market Research has published a new report titled “Gold Nanoparticles Market by Application (Imaging, Targeted Drug Delivery, Proton Therapy, In-Vitro Assays and Others), and By End Users (Healthcare, Electronics, Chemicals and Others): Global Industry Perspective, Comprehensive Analysis, and Forecast, 2017 - 2023”. According to the report, global gold nanoparticles market was valued at approximately USD 2.01 billion in 2017 and is expected to generate revenue of around USD 5.15 billion by the end of 2023, growing at a CAGR of around 17% between 2017 and 2023. Gold nanoparticles are the type of particles which are metallic in nature and are generally brown in colour with powdered form. Reports state that colloidal gold nanoparticles have been utilized for centuries by artists for their vibrant colors, which are produced by their interaction with visible light. Brust and Schriffin achieved a breakthrough in gold nanoparticles synthesis in 1994 by creating organic soluble alkanethiol-stabilized gold nanoparticles, which possessed higher stability as compared to the other discovered gold nanoparticles. Spherical gold nanoparticles possess useful properties such as size-related and shape-related optoelectronic properties, large surface-to-volume ratio, excellent biocompatibility, and low toxicity. Gold nanoparticles can be thoroughly dried and redispersed in solution without any aggregation making them excellent precursors. The gold nanoparticles market is segmented on the basis of application into imaging, targeted drug delivery, proton therapy, in-vitro assays and others. The imaging segment is expected to dominate the global gold nanoparticles market due to the increase in demand for its use in imaging and various diagnosis processes. The targeted drug delivery segment is also expected to show significant growth. On the basis of the end user, the market is divided into healthcare, electronics, chemicals and others. Healthcare segment is expected to dominate the global gold nanoparticles market in the forecast period due to the increasing awareness about its diagnosis and treatment in various diseases. North America, Europe, Asia-Pacific, Latin America and Middle East & Africa are the regional segments of global gold nanoparticles market. North America is anticipated to remain the leading region over the forecast period due to increase in investment in healthcare and increasing awareness about health-related problems. The growth in Europe is expected to be steady as gold nanoparticles are used in various fields. The Asia Pacific is expected to show rapid growth rate in forecast period because of its increase in the electronics industry. Latin America and Middle East & Africa are also expected to show a steady increase in demand for gold nanoparticles market in the forecast period. Some of the key players in the global wine market include BBI Solutions, Johnson Matthey Plc, Meliorum Technologies, Inc., Innova Biosciences, Cytodiagnostics, Cline Scientific, NanoComposix and Tanaka Holdings. Major players are frequently engaged in developing efficient gold nanoparticles which can be used in various fields.